Israel versus Iran: the Coming War | Have Ye Not Read? This week, much to the consternation of the rest of the western world, President Trump pulled the U.S. out of the six-nation nuclear deal with Iran, and affirmed that he was going to institute some of the toughest economic sanctions yet against the Iranian nation. He also threatened Iranian leaders with “severe consequences” should they restart their nuclear weapons program. Almost simultaneously, as if on cue, Israel began an aerial bombing campaign against Iranian military targets in the Quneitra province south of Damascus, Syria. This aerial bombing attack triggered a counter-attack consisting of a barrage of some 20 rockets and artillery from Iranian positions near Syria’s southern border, directly into Israel-held land in the Golan Heights. “Iran has directly attacked Israel for the first time as it launched missiles in the annexed Golan Heights region, Israel’s army has claimed. An Israeli air defence (IDF) spokesman said “about 20 rockets” were fired by Iranian Quds Force at the Jewish state’s defensive line in the area – which has been occupied by Israel since 1967. 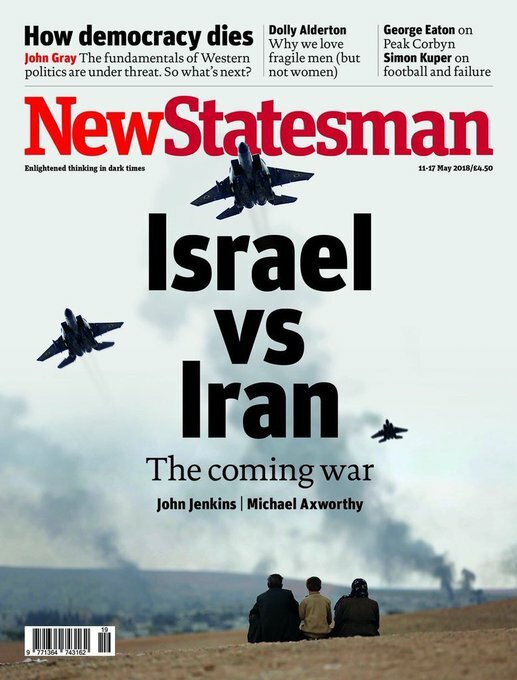 While this week’s issue of the New Statesman has not yet been released, its editors released the cover photo in advance, I assume so they can say they “predicted” the expected war in advance, should it indeed happen now. So Is Daniel Chapter 8 About to Be Fulfilled? So does this mean the long-awaited fulfillment of Daniel chapter 8 is about to take place, in which Iran, symbolized by a ram, is attacked and completely defeated by a military power symbolized as a “he goat” in the final days of this flesh earth age? Well, as the old saying goes, “Keep your powder dry.” We’ve been here too many times in the past to make a conclusive statement like that. War with Iran has been predicted for the past decade, at the very least. But…we’re supposed to be watchmen of God (Ezekiel 33). Therefore it’s our job to stay on the watch and report what’s happening. And dramatic events precisely like this are the stuff war is made of. And in one report out of Israel, from Haaretz.com, the Israeli Energy Minister stated that Israel would even assassinate Syria’s president Assad if he continued to allow Iran to operate out of Syria. So we have all of the makings of a war in motion. The question is: Now, or later? And the answer is: It doesn’t matter. It’s going to happen — today, tomorrow or a year from now — because it’s written. So you should be ready for it, and for all of the remaining prophetic events of the end days, to begin playing out. In short, the defeat of Iran by the “he goat” of Daniel chapter 8 directly presages the deadly wound at Jerusalem…the beginning of the four winds of Revelation chapter 7 and Daniel chapter 7…the ushering in of Satan’s one-world system…and finally the arrival onto the scene of the antichrist himself. To learn more about the events of the end of this age, including the war on Iran and the deadly wound of the great book of Revelation, see the Bible study, The 4 Winds and the Deadly Wound.